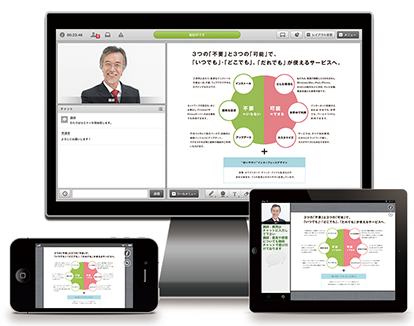 V-CUBE Web seminar service [V-CUBE Seminar's new user interface] | V-cube, Inc.
V-CUBE, Inc. (HQ: Tokyo, Founder and CEO: Naoaki Mashita) develops and provides visual communication service such as web conference and web seminar solutions that is available “anytime, anywhere, anybody”. In order to maximize the coverage of web seminar, V-CUBE Seminar will be updated on June. 5Th, 2013. Based on a total of more than 8 million hosted seminars since the start of this service, nearly 20,000 seminars yearly as well as enterprise customers feedback from presenters and participants, V-CUBE seminar will release a brand new user interface with many improved features. The new V-CUBE Seminar is optimized for easy access, it is easy for anyone to host and participate in two way communications seminars with convenient features such as questionnaires. Compared with ordinary seminars hosted in lecture halls, web seminar provides convenient features like text chat and questionnaires to improve the flexibility of two way communication in seminars. Moreover, eliminating limitations of time and distance, hosting a seminar and stream to different locations even overseas where all location will receive synchronized information, improves the efficiency of seminars. Not only on PC, this seminar service is also available on smartphones and tablets. Also, not only live seminars, the live contents can be recorded and converted into on-demand contents for future review. For the aforementioned reasons, V-CUBE Seminar is the ultimate solution for not hosting company training session internally, but it is also a great way to explore new customer space, share information about new products with customers and partners, services offered internally, and other wide range of use cases. This V-CUBE Seminar updates is aimed to accommodate various use cases by increasing the usability on both the host and participant side of the web seminar. Decrease the number of button on the screen, increasing the space for whiteboard area and text chat space used for the communication between hosts and participants. Additionally, there are more layout options available for users to fit their use case and preference. Improved the flexibility of questionnaires and increased ways to elect answers. For hosts, they do not only have two ways to set answering method freely, they can utilize the preset from quick questionnaire feature to have participants answer questions. Questionnaire is not only a feature that can be utilized multiple times during a live web seminar, by quickly collecting answers, hosts can gain a sense of participants' understanding while effectively host web seminars. High quality is now available for web streaming, international audio and video codec H.264 support. To improve the quality of participants when participating through audio echo canceler feature is enhanced drastrically. From now on, V-CUBE aims to continue to provide customers with the best service by continuing to enhance the flexibility and strength of various features.